My Wey of Life: Smiley Face Moon! This is so amazing!!!! 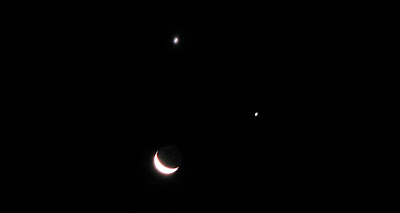 Jupiter , Venus and the moon!! I love my camera! Joe and I playing around with G9 just to capture this special moment! There will be a spectacular conjunction between the two planets Venus and Jupiter and the crescent Moon. Though the conjunction will be impressive from anywhere in the world, it will only smile on Australia and Australian longitudes almost in the form of a “smiley” emoticon. From the USA, for instance, the conjunction will be in the form of an upside down sad face. It won't happen again until 2036! or some says 5 years..
Whatever it it, I wish everybody happy and smile always!!! !